Availability: In Stock., 819 Available. 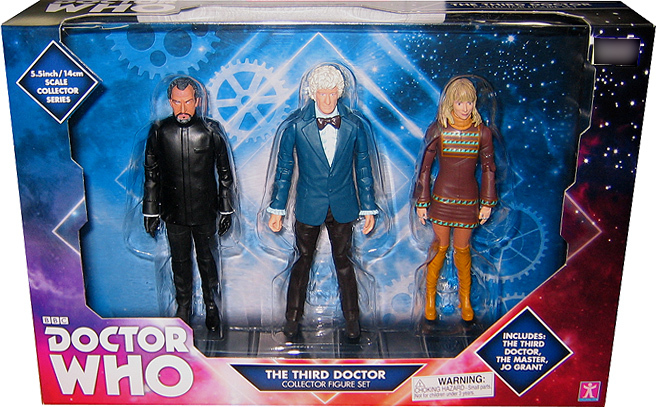 In the 5" range of figures, contains the Master, the Third Doctor in blue jacket, and companion Jo Grant. Limited Edition Exclusive Set (Who North America Exclusive to the North American Market). Great set! The only thing that prevents this from getting 4-5 stars is the fact that the left arm of my Jo Grant figure is barely hanging on, ready to fall off. So excited to see this set and its new looks for Jo and the 3rd Doctor! A great addition to the action figure line and my collection. I hope the 5" scale classics and newbies keep coming!